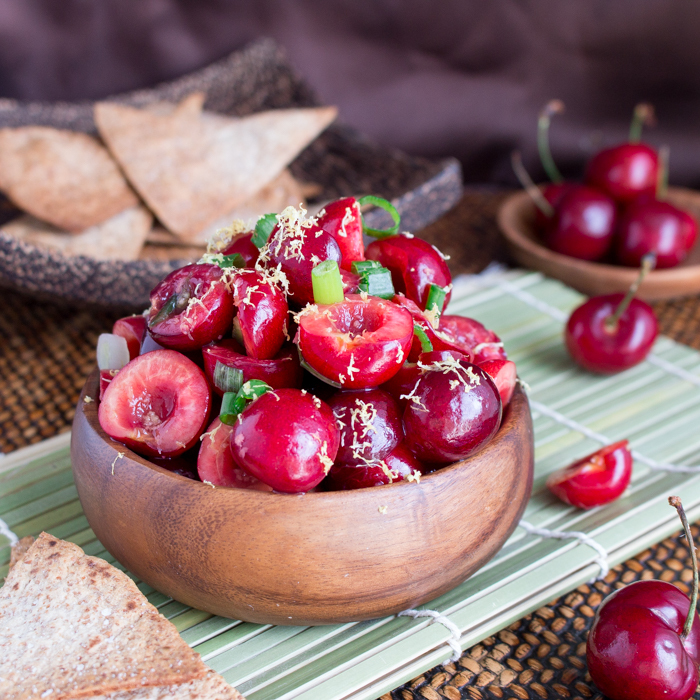 You are going to love this quick and easy Cherry Ginger Salsa as it is slightly sweet from the cherries, a little warming from the ginger, a little spicy from the jalapeño and fresh from the squeezed lime and lemon citrus zest. 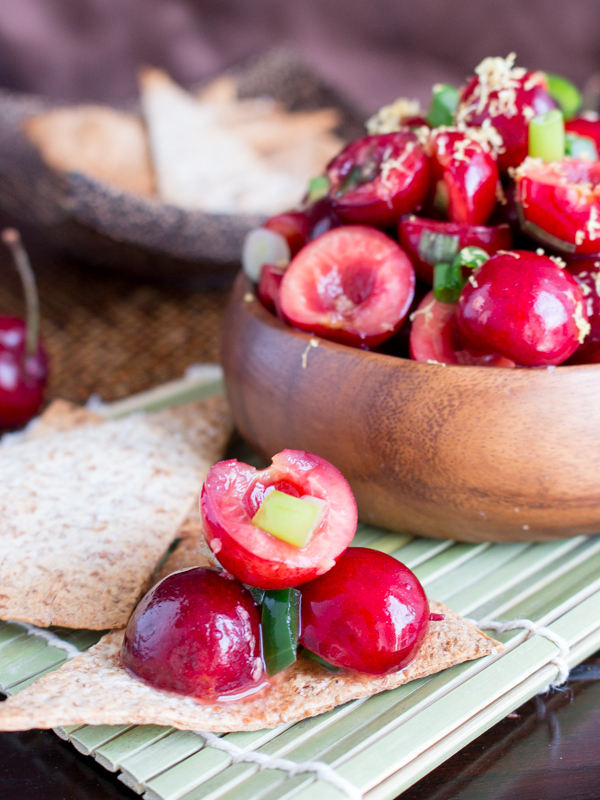 Whether you enjoy this fresh Cherry Ginger Salsa with tortilla chips or on top of your favorite grilled meats, this is one surprisingly fun treat. 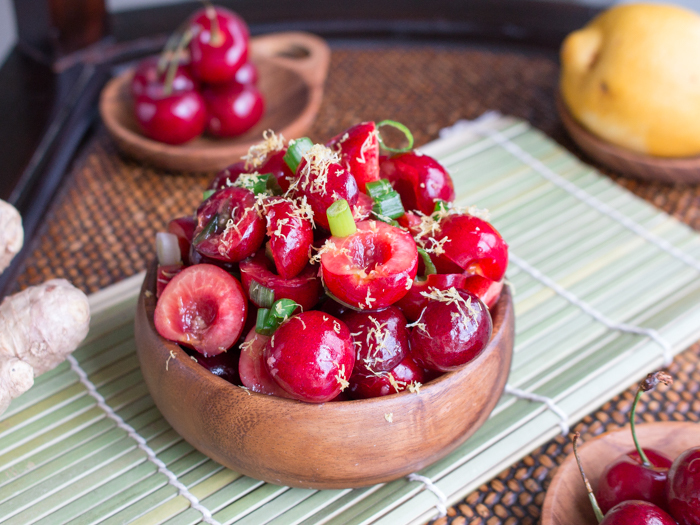 You can crush or chop your cherries into smaller slices, if you wish, but we wanted them just in halves to showcase some other delicious recipes coming your way. With the 4th of July weekend drawing near, you need some easy recipes that just scream deliciously red, white and blue. We got your RED covered! If you are looking for some other delicious recipes, be sure to check out our holiday recipes. Coming soon to a monitor near you is another delicious way to enjoy this salsa that is going to knock your socks off—so stay tuned. 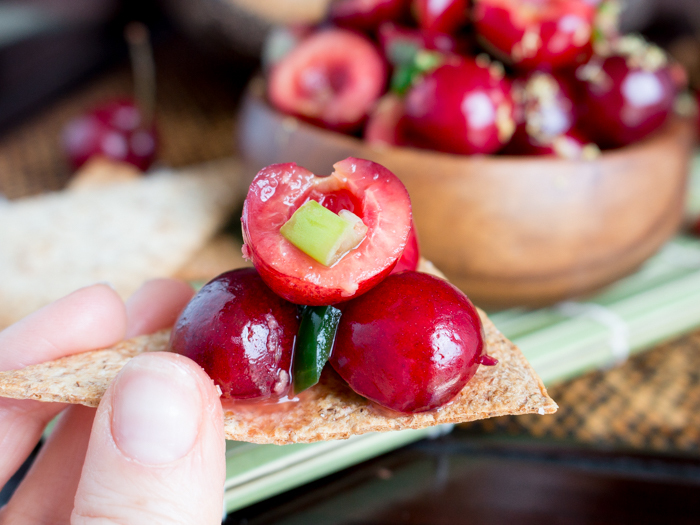 Another deliciously fun appetizer idea to make with your fresh cherry ginger salsa on top of grilled crostini slathered in ricotta or cream cheese then served with a dollop of cherry ginger salsa. Totally heavenly! We had a slight incident here on Healthy World Cuisine where someone (not mentioning any names) helped themselves to the gluten-free tortilla props for the photo shoot. Hmmmm?!? Anywhoo… no worries! Did you know you can whip up a batch of freshly baked gluten free tortillas in less than 15 minutes’ flat? You must love that! Snacking without a plan and still delicious and healthy. How to make homemade gluten free baked tortilla chips in a flash…. Cut your gluten-free flour soft tortillas (can also use corn or regular soft flour tortillas) in rectangles or any little shape you desire. Lay your cut soft tortillas on the baking sheet. Spray lightly with olive oil and season with salt and any flavors of choice like cumin, chili, taco mix, etc. Bake for about 10 minutes or until golden brown. Keep an eye on them as they brown fast. 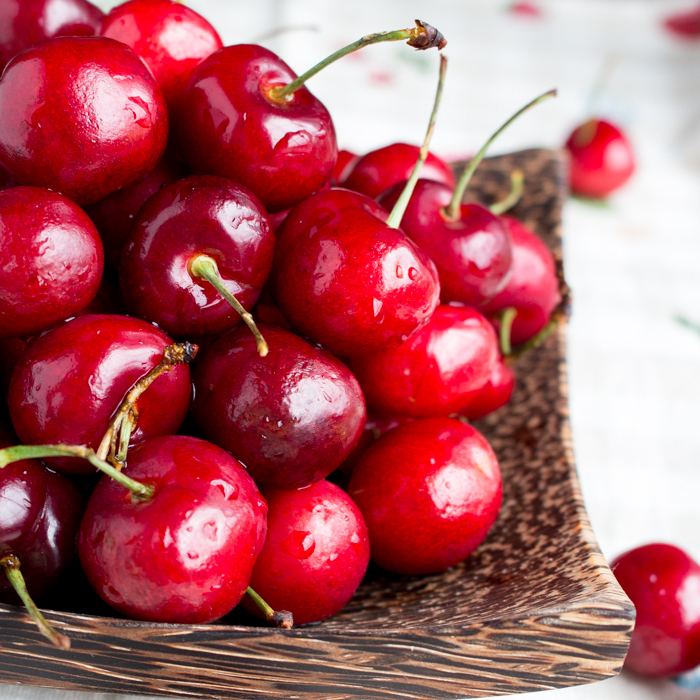 Michigan is known for their deliciously sweet cherries and they are in season right now! Yippee! We love eating seasonal plant based foods and incorporating these into our meal plans. Eating seasonally means it is less expensive and, they have best flavor as everything is at its peak ripeness. You can pit and slice and all your ingredients, except for the lime/lemon juice and zest so that your cherry salsa stays fresh. The citrus juice starts to break down the salsa as it sits so add that just before serving. This salsa is also delicious made with blueberries, strawberries and watermelon. You better the double the batch as it goes fast. Don’t tell us we did not warn you! 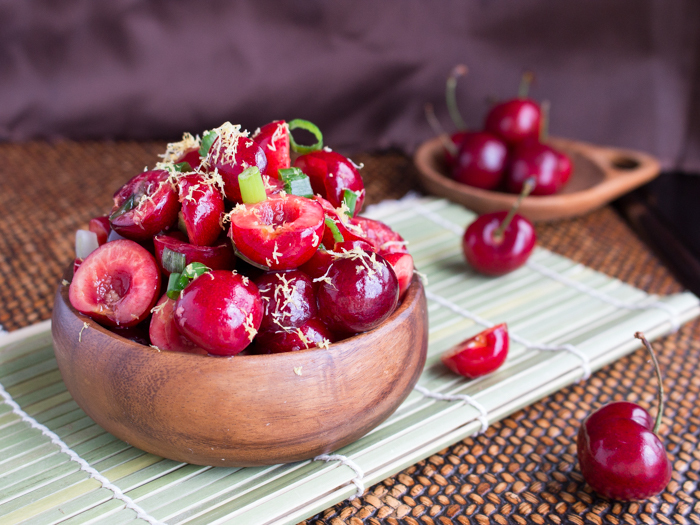 If you already own a cherry pitter, lucky for you. For the rest of us, the fastest way I have found to get the pit out of the cherry is using a small tipped pastry tip. Also, the old fashion knife method works out A-okay too. We tried the chopstick at the end over a bottle trick and just made a mess. 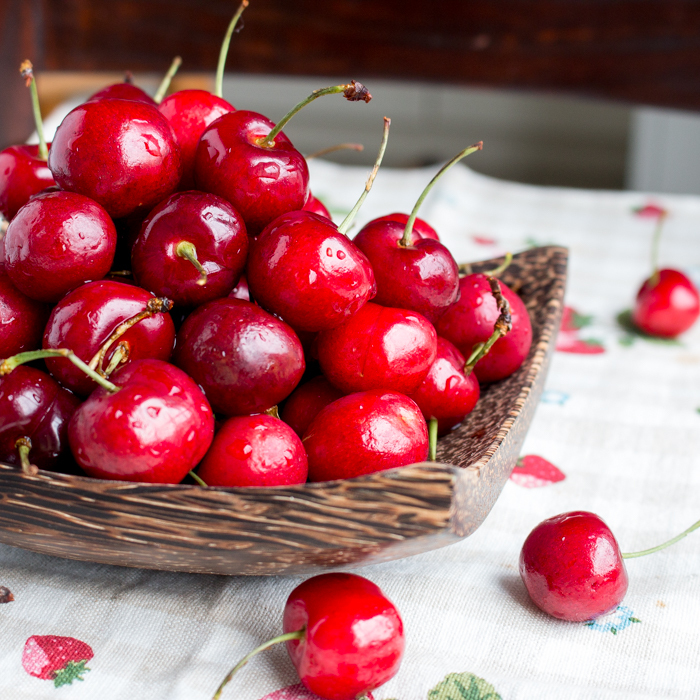 What are your favorite ways to pit a cherry? 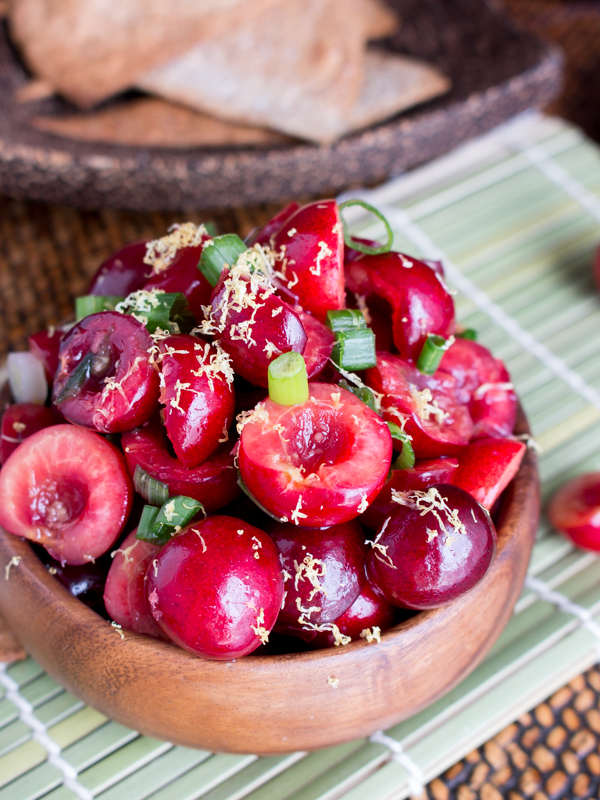 1In a medium bowl, add the pitted and sliced cherries, green onion, grated ginger, jalapeño , salt to taste. If serving right away also add the lime juice and lemon zest. If not add just before serving and garnish with cilantro if desired.